Welcome to the Conference of California Historical Societies! The mission of the Conference of California Historical Societies is the preservation of California History by unifying and strengthening Historical Organizations throughout the State. It is with great sadness we announce the passing of CCHS Past President, Barron Smith. Barron passed away on December 16, 2018 with his wife Kyle and close friend Robin by his side. Barron was devoted to heritage preservation and donated his time and expertise not only to CCHS but as state division commander to the Sons of Confederate Veterans among many other historical organizations. A Celebration of Life will be held at the South County Historical Society's Heritage House Gardens at 128 South Mason Street, Arroyo Grande on March 23rd at 2 pm. Read about the details. See the photos. Click on the 2019 Winter Workshop tab (above right). It is time NOW to make your commitment to CCHS! We thank you for your support and we look forward to working with you in the coming year! Your membership will help us continue to meet the needs of Californians who care about and protect our state’s history! Click on the Membership tab on the above navigational bar to make your membership type selection. If you wish to pay by check, send your $50 Individual/Historical Organization ($500 Corporate) dues donation to CCHS, 112 Harvard Avenue #15, Claremont CA 91711. With your check, please include your name/historical organization name and contact information. If this is a membership renewal, use the same name as previously used to join CCHS. For detailed information on the exciting events for 2019 and the accomplishments from 2018, please click on the President's Letter (left). Conference of California Historical Societies was founded in 1954 as a federation of historical societies, museums, libraries, and other history-oriented groups and individuals with a common appreciation and love of history. CCHS helps historians, and others who are interested in history, to connect and share information -- joining efforts to preserve records, artifacts, sites, and buildings. This website is the gateway into joining this unique endeavor with other passionate individuals and groups throughout California. The network of sharing is in place and ready for your involvement. CCHS also helps local societies and small museums with skills in management, acquisition, preservation, and restoration techniques. Through its extensive series of workshops and annual meetings, CCHS is delivering what you need to be successful. Join us in continuing our legacy. Become a member! Our CCHS Trust Fund Committee met on Tuesday, December 11th in Fairfield CA. The meeting was hosted by Todd Shulman of the Napa Police Historical Society and CCHS Regional Vice President, Region 35 (Napa/Solano Counties). The review of the Trust Fund Portfolio resulted in no changes, but continued discussion occurred about continual oversight of the Fund and potential fundraising opportunities. Donations are very much appreciated can be made above on the upper navigation bar using the "Donate" tab. The Committee nominated and was pleased that Todd accepted the position of 2019 CCHS Trust Fund Committee Chair with the outgoing Chair, Al Minard (Regional Vice President Region 13 (South Alameda County) receiving a beautifully designed certificate from CCHS President Therese Melbar (second from right, RVP Region 22 (Kern County) for Al's many years of Trust Fund Committee service. Barbara Kimbell Trust Fund Committee member and CCHS Secretary participated. Kris Payne Trust Fund Committee member (group photo photographer, RVP Regions 38 (El Dorado County) and 16 (Amador/Calaveras/Tuolumne Counties) also participated. NHD California State Finals will be held on May 10-12, 2019 @ William Jessup University, Rocklin, CA. This year's theme is Triumph & Tragedy in History. For information, visit the NHD/California website and to find more information, visit the National website. Also, check out the latest postings on Facebook and Twitter. "NHD is a year-long educational program that encourages students to explore local, state, national, and world history." *Engaging students and teachers in historical research & skills development* Remember Volunteers are always needed and appreciated. So get involved! 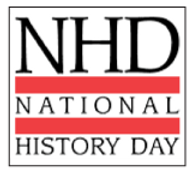 The intentional selection of the theme for NHD is to provide an opportunity for students to push past the antiquated view of history as mere facts and dates and drill down into historical content to develop perspective and understanding. The NHD competition has two divisions based on school grade. Entries in each division are judged separately at all levels of competition. >We hope you agree that CCHS serves a important role in perpetuating California history. If you are an individual that loves California history or a member of a historical group, please consider joining the CCHS effort. Your membership will help advance our programs and help us preserve California’s rich past. Your favorable decision to join us will result in you acquiring benefits available only to members. If your ready to join our family, click our Membership tab at the top of the page or click here to join. >If your still not sure about joining, follow our program on social media. Use our Facebook page, follow our Twitter feeds, or click here and you will be added to our mailing list. We believe that you are important and wish to find out more about your interests. Stay active! Stay passionate!